"WE HAD FIVE YEARS LEFT TO CRY IN"
I have to admit that the point of reference leading me to group together the three "recent"* albums I'll be commenting upon here--Morrissey's Years of Refusal, The Killers' Day & Age, and Franz Ferdinand's Tonight--is mostly personal and thus fairly arbitrary; in any case, a tiny explanation is in order. I remember very well the last time Morrissey, Franz Ferdinand, and The Killers released long-players that together comprised the aural dimension of a particularly memorable stretch in my life. It was 2004, and I spent all summer listening to Moz's You Are the Quarry; The Killers' debut, Hot Fuss (which I still consider a silly title that hardly does the album justice); and Franz Ferdinand's own eponymous début. It was an optimistic season, one that immediately followed my Big Decision to go ahead with the long haul of becoming a college graduate, and one during which I left the U.S. for the first time ever, spending a gorgeous, restorative June week in Vancouver, B.C., une très jolie ville. My memory refracts that summer as adventurous, serenely hopeful, impossibly bright and warm/not-too-hot, full of gentle breezes and a sense--for the first time in my life, perhaps--that the unknown future might possibly hold many wonderful things. My favorite songs from those albums, and there are many, comprise the soundtrack of these memories (that's just the Original Soundtrack; the score is Arvo Pärt's Alina and Mahler's Symphony No. 5, Adagietto). Now it's five years on, and if those albums of yore are inextricably bound in my personal history to the auspicious, energetic beginning of a long journey, the more recent triptych will doubtlessly be connected by the same mechanism to that journey's imminent end. 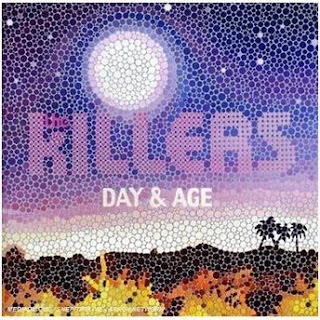 Day and Age was actually released near the end of 2008, and it is, at the very least, further proof that The Killers--while fully committed to those classical pop values of hooks, melodies, and a certain emotional urgency and romanticism--are not content to rest on their laurels. They challenge themselves to broaden their sonic range with each release; listening to them can make one believe that there are, in fact, nearly infinite new ways in which to reiterate and refract those "old" popular-music mores. In 2006, they boldly (or, some would say, foolishly) followed up their Anglophilic début with Sam's Town, a work of American-spirit crypto-mythology that was riddled with a sweet melancholy that seems to be a mark of so many memorable, identifiably American works of art, whether it be The Great Gatsby or Magnolia. For all singer/lyricist Brandon Flowers' contemporaneous talk of wanting to love his (then rather unlovable) country and show his pride in the red, white, and blue, Sam's Town was a peculiarly apt soundtrack to those waning, dispirited days of the Bush era. With Day and Age, they have found the overlap of the lyrical themes of the first album (meager beginnings, unfulfilled longing, and teenage depression captured romantically in a rear-view mirror) with the second (paens to American life and legend in all their compromised, hardscrabble glory). Sonically, it's a leap akin to the one The Auteurs made when they followed up the single-mindedly explosive guitar assault of After Murder Park in 1996 with the much more trebly, ornate production of How I Learned to Love the Bootboys, which is to say that the Killers' palette now abruptly contains much less guitar roar and many more shiny little sonic accessories. From the syncopated handclaps and surprise polyrhythmic break in "Spaceman" to the African-inspired chant-singing on "This is Your Life" and the surprisingly good mariachi-folk-tropical hybrid "I Can't Stay," The Killers have gone eclectic, Blondie-Autoamerican style, without succumbing to that half-good album's weakness for the empty exercise (or, worse, the dread Beck's misguided commitment to studied, hollow, worn-on-the-sleeve "eclecticism" as the principal, if not the only, reason for a song to exist). My favorite song on the album, however, is the cinematic "A Dustland Fairytale," the sweet melody and progressively urgent epic structure of which deliver all the tender rue implied by the title; it's the centerpiece of the album's cluster of such rich, catchy gems, in which I would also include "Losing Touch" and "Neon Tiger." The Killers have yet to produce a perfect work--"Human," for the most prominent example of a flaw on Day and Age, seems a bit obligatory, slight, and tinny, as if the band felt beholden to live up to simplistic new-wave typecasting--but Day and Age confirms that they have plenty of good ideas as well as the ability to construct and execute them in increasingly intriguing and satisfying ways. Franz Ferdinand also try to avoid treading water on their unimaginatively titled latest album, and although they do in a way accomplish that particular goal, I cannot say I find the results of their experimentation to be on par to that of The Killers'. The album's first track and single, "Ulysses," is perfectly listenable, catchy and melodic, but the acid synths and singer Alex Kapranos's newly extra-louche vocals can't disguise the fact that it's really just a modified rendition of the band's big smash hit of '04, "Take Me Out," with some slightly more novel touches and a somewhat less throwaway lyric. They've followed that up with a catchier second single, "No You Girls," which has a wonderful verse-chorus melody and a haunting falsetto bridge; like "Ulysses," though, it's another variation on the "Take Me Out" template. But all that proof of Franz Ferdinand's ability to do very well what they've already done well before is interspersed with some moments in which the band does seem to be tiptoeing toward the unfamiliar; with the mellow melody and surprise tempo shifts of the Monochrome Set-like "Send Him Away," for example, and with the glam-rock tinged "Twilight Omens," the old-fashioned analog bleeps of "Live Alone," and the stomping "Can't Stop Feeling." 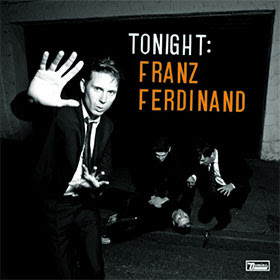 Thus, after repeated listens with a focus on these more interesting tracks, I've come to consider Tonight: Franz Ferdinand an enjoyable flounder and a passable effort that might be considered a minor but worthy entry in a multiple-album body of work. But since that body hasn't yet been created, the next step will probably need to be more decisive if the fascination of Franz Ferdinand is to remain intact. From the snarling Buzzcocks buzzsaw guitar of the powerfully catchy album-opener "Something Is Squeezing My Skull" to the fade-out of "I'm OK by Myself"'s distorted, unfettered, high-speed and high-energy version of the same distinctive "yodeling" (I don't know what else to call it) with which he closed "The Boy With the Thorn in His Side" lo these many years ago, it's clear that the chanteur's postmillennial resurgence perseveres unabated. 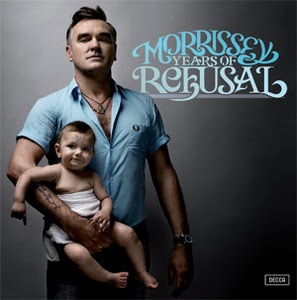 The album bookended by these songs is Years of Refusal, produced by the late Jerry Finn, who was also behind the soundboards for Moz's 2004 "comeback," You Are the Quarry. Along with that album and 2006's Tony Visconti-produced Ringleader of the Tormentors, Years forms a sort of triptych, and it easily, confidently attains both the sharp immediacy of the former and the more layered, experimental feel of the latter. The album has one irresistible melody, movingly and/or provocatively worded lyric, and emotionally dangerous vocal after another. Actually, two of the tracks--the propulsive "That's How People Grow Up" and the taunting, punky "All You Need Is Me"--seemed a bit of a cheat at first glance, given that both had previously been released in 2008 as "new track" singles off of the most recent in a too-long-even-for-Morrissey list of Greatest Hits packages. However, they work so naturally in the structure and flow of this album that, at worst, their qualities are highlighted; at best, the context makes them sound as if you're hearing them for the first time. The properly brand-new songs are uniformly excellent; I particularly like "When Last I Spoke to Carol" and "One Day Goodbye Will Be Farewell," both of which set Boz Boorer's rapid acoustic-guitar strumming like some kind of shimmering percussion against Jesse Tobias's glammy electric-guitar licks as a backdrop to some of Moz's most brilliantly funny-tragic lyrics ever (my favorite, from "One Day...": "I have been thinking--what with?-- my final brain cell/How time grips you slyly in its spell"). The album draws to a close with two majestic ballads: the almost disturbingly suggestive "It's Not Your Birthday Anymore," in which we're seduced by Morrissey's falsetto and the song's multiclimactic(!) structure, and the elegiac "You Were Good in Your Time," which samples a bit of Jean Gabin's tragic-tough dialogue from Pépé le Moko. While it is perhaps imperfect (I find the energy drops off a bit, with two more songs to go, after "You Were Good in Your Time"), Years of Refusal is yet another brilliant star in the (thankfully) still-expanding constellation of an artist who only seems the more vital and indispensable the further we are dragged kicking and screaming into an era where all music is accessible all the time, and in which the short duration of most singers'/groups' "careers" seems to tidily reflect that nonstop oversaturation (quantity over quality and novelty over longevity, thy name is "MP3"). Morrissey still has vision and inspiration to spare, and the prospect of his continuing to share it with us is one of the few things that keeps me feeling at all connected to, or interested in, pop music. *This post was originally begun on 1 July 2009, and only now have I had a moment to ready it for "publication."